'Bristol meets Brazil: 'Transform I’ is the result of many years of work carried out between these two musical hubs. A heavy, authentic blend of roots and dub reggae, Dubkasm’s sound varies from militant digital steppas to acoustic vocal tracks, with Brazilian rhythms and samba instrumentation occasionally woven into the mix. Atmospherics and percussion recorded in Brazil reflect the journey of producer Digistep tracing his Brazilian roots, as instruments such as berimbau, zabumba, cavaquinho and cuica are called into play, while his Bristolian counterpart DJ Stryda captures some of the finest vocalists from the UK’s reggae and dub scene and promotes the material worldwide. The album’s conscious Rasta messages are conveyed over lovingly-crafted roots rhythms. Amidst the more traditional dub styles, nyahbinghi drumming bonds with samba, capoeira percussion rides one-drop rhythms, and the first album to mix UK dub with Brazilian influences is born. "Like many innovations heard for the first time, you wonder why this has not been done before. The Brazilian percussion of zabumba, cavaquinho and cuica fold neatly into nyabinghi-style drumming on the old school rasta chant of 'Brazilian Moses', and peps up the steppers of 'Sangue Brasileiro'. These functions are used sparingly on a debut that turns out more orthodox than first expected, but that orthodoxy is a strength, as DJ Stryda and Digistep's production ranges across the stylistic spectrum of roots reggae. Basic tracks were laid at the Dubkasm Studio in Brazil, with overdubs at studios in London, Nottingham, Bristol, Norway and the Digitaldubs Studio in Rio de Janeiro catering for a large cast of vocalists including Dub Judah, Tena Stelin, Levi Roots and Afrikan Simba. 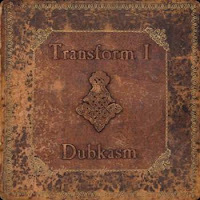 Transform I's well-crafted arrangements utilise horn section, flute and melodica in equal measures - just go to the instrumental 'Nyah Keith' (not the Burning Spear tune) for an example of modern roots reggae at its finest. As an object, the double vinyl with gatefold sleeve, featuring a beautiful piece of naïve art from Ras Ropert, is irresistible."